I am writing this in haste as I want to get it on my blog before closing my laptop for the last time here at Qatar Academy. Tomorrow I leave Doha, however I have a feeling I may be back sometime in the future. But for now I am off, first to NECC, then other travels around the USA, then home to Melbourne in Australia before going to Beijing to start a new position by the end of July. I want to share some work a team of us here at QA have completed this week. This has taken a few months, but we are all pleased with the outcome. We agonized over the diagram....and many other parts of document. Thank you to ISTE NETS.S for the inspiration and essential structure for the final constructs. Other acknowledgements are on the wiki, but a special thank you to Kim Cofino and the ISB documents for 21st Century Literacy. 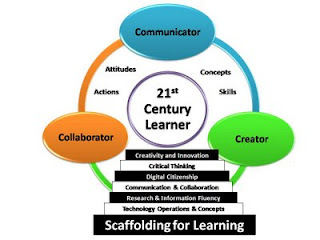 The 21st Century Learning wiki and attached document, is the foundation for professional development and curriculum planning for next year. It starts with the Vision, talks about the Learning, invites people to share best practice, has detailed Constructs for Learning that scaffold 21st century learner objectives, and shares an interview series with educators and one student from different areas across the school as they talk about successes in their own lives and classrooms with digital learning. I encourage you to watch the interviews, apologies for the fairly rough video work, however the message is clear, and provided by a determined collection of learners who willingly shared their highs and lows when embedding 21st century learning and Web 2.0 into what they do. Look forward to hearing from you later, then! First thought after reading this: I would 've loved to work with you!!! Julie, this is so fantastic! I love the graphic and the wiki has so much thorough and thoughtful detail - no surprise coming from you and your team in Doha. So looking forward to see where this goes over the next school year - in Doha, Beijing and Bangkok!